On view at Studio Museum 127, Harlem Postcards is an ongoing project that invites contemporary artists of diverse backgrounds to reflect on Harlem as a site of cultural activity, political vitality, visual stimuli, artistic contemplation and creative production. Representing intimate and dynamic perspectives of Harlem, the images reflect the idiosyncratic visions of contemporary artists from a wide range of backgrounds and locations. Each photograph has been reproduced as a limited edition postcard available free to visitors. This season, we are pleased to present postcards by Judith Bernstein, Teresita Fernández, Scherezade García, and Baseera Khan. 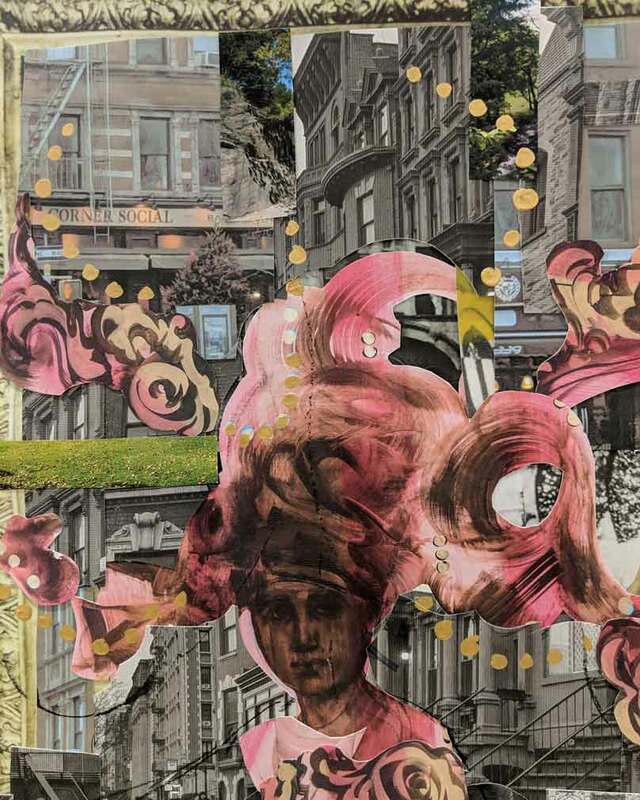 Harlem Postcards Spring 2019 is organized by Eric Booker, Exhibition Coordinator and Alexandra Adams, Curatorial Fellow. Citi. Proud Sponsor of Harlem Postcards. My Dream postcard unites my 1995 drawing with the historic Apollo Theater. Dream evokes and transforms the most iconic speech of the civil rights movement and of American history itself: “I Have a Dream,” by Martin Luther King Jr. Dream also expresses reverence for the dreams of the many who have performed at the Apollo, as well as those who aspire to. Every year, 1.3 million people visit the Apollo Theater, and thousands have performed there over the years, including Aretha Franklin, Ella Fitzgerald, Nina Simone, Billie Holiday, Stevie Wonder, Prince, Pearl Bailey, Charlie Parker, Thelonious Monk, Sarah Vaughan, Duke Ellington, Bill “Bojangles” Robinson, Cab Calloway, Josephine Baker, Etta James, Sammy Davis Jr., Bessie Smith, Louis Armstrong, Otis Redding, Lester Young, Dizzy Gillespie, Dionne Warwick, Charles Mingus, Gladys Knight, Smokey Robinson, Mahalia Jackson, James Brown, Michael Jackson, Jimi Hendrix, Lena Horne, Little Richard, Bob Marley, Buddy Holly, Count Basie, Richard Pryor, Dinah Washington, B.B. King, John Coltrane, Diana Ross, Nat King Cole, Chuck Berry, Fats Waller, Sidney Poitier, Sister Rosetta Tharpe, Ray Charles, and Miles Davis. Those are just a few of the EXTRAORDINARY geniuses who have graced that stage and achieved international stardom. I have lived in New York for over fifty years! The city changes constantly but the landmarks that stay are integral to our collective identity as New Yorkers. 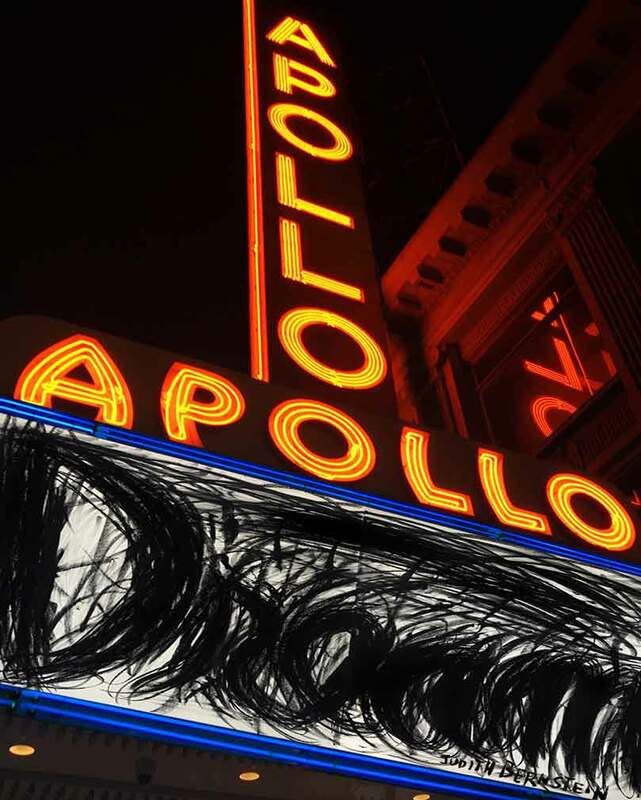 The Apollo is HARLEM! The Apollo is NEW YORK CITY! I was thinking about how the boundaries of what we call Harlem have historically been manipulated, redrawn, and renamed. In this ever-shifting construct, artificially created boundaries have served to control not only land, real estate, ownership, and agency, but also perception, and how Harlem has come to exist in the collective imagination. I’ve always been especially interested in how Harlem and East or Spanish Harlem are perceived as distinct and separate areas. What, and where, exactly, is that imaginary, subtle dividing line? Is it a real, demarcated boundary or an invented idea that is constantly changing? And when did it shift from being called Spanish Harlem to the somehow more sanitized East Harlem? Traveling east on 125th Street, it feels like East Harlem starts after you pass under the overpass at Park Avenue. 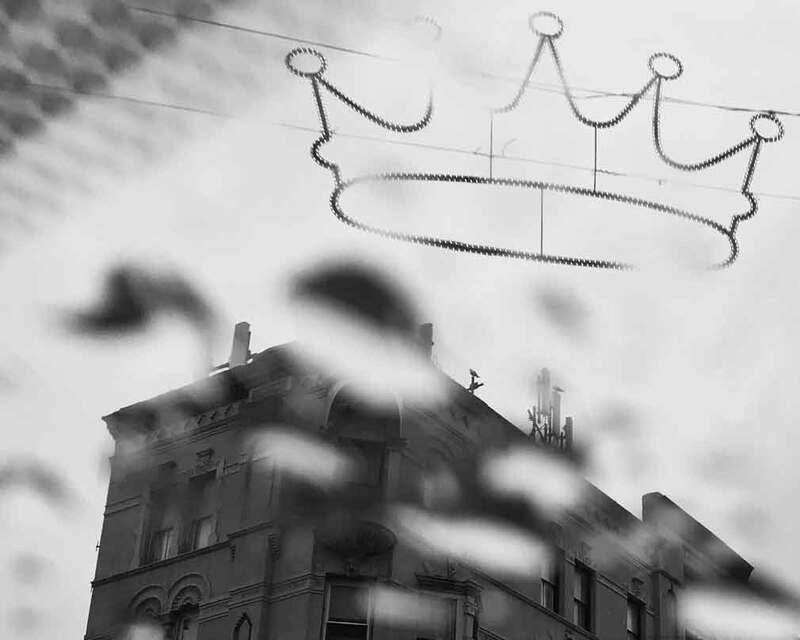 On a rainy January afternoon, a couple of blocks in, I saw the gray sky punctuated by the suspended, crown-shaped lights overhead to celebrate Día de Reyes, (feast day of the Epiphany), celebrated by Latinx, Afro-Latinx, and Spanish-speaking Indigenous people in the United States, Latin America, and the Caribbean. As an abstract image, I was mesmerized by that very poetic, elevated, hovering shape, literally crowning the neighborhood with light. It reminded me that, in colonial times in Cuba (where my family is from), Día de Reyes also marked the only day enslaved Afro-Cubans could legally celebrate their religious music and dance in publiíc spaces, which were highly regulated by their Spanish oppressors. In many ways, it’s ironic that Spanish Harlem, as a defining name for this area, alludes to the language of the colonizers. This crown image has an added significance to me within that Afro-Cuban and Afro-Latinx diasporic context. Ultimately, I chose this image because it is uplifting and radiant, and because it celebrates the important presence of Latinx people in Harlem, in both the African and Latin American diasporas, and in black culture. When I think about Harlem, I see a layered and constantly evolving landscape, a landscape informed by the history of the island of Manhattan, from its rocky ecology, to the battles of the American Revolution, to the African-American experience of migration, voice, renaissance, and struggle. The way I composed and juxtaposed the images in this composition alludes to the complex, ever-changing landscape of the neighborhood. These aspects of the African-American experience in Harlem collectively create a portrait of resilience and resistance. I created a central figure with a brown-cinnamon skin tone as an expression of my politics of inclusion and the many colors that live in my skin. It is, to me, a reflection of us. I take ownership of all those colors. The figure is wearing a headdress reflecting the African Diaspora that reaches out in every direction, across the neighborhood’s landscape. It’s expanding fabric represents expanding geography, a place that has grown beyond the frame placed on it by colonial history, beyond its own physical borders, beyond time itself. My contribution for the Harlem Postcards project relates to my desire to show the interiors of sacred spaces in Harlem—interiors that are familiar to me due to my background. Upon entering these familiar spaces time and again, no matter where I am in the world, one particular image sticks with me. Feet resting on a vast stretch of carpeting. Bodies at ease within a protected space. Feet are the feat of Harlem.